Microsoft has started taking pre-orders for its customized versions of the Samsung Galaxy S9 and Samsung Galaxy S9+. Just like it did last year with the Galaxy S8 and Galaxy S8+, Microsoft will have these phones available at Microsoft Stores in the U.S. Nothing about the hardware has been changed. The additions include a slew of Microsoft apps that become available to users of both models. Microsoft is keeping the pricing structure the same. The Galaxy S9 is priced at $720, and the Galaxy S9+ will set you back $840. 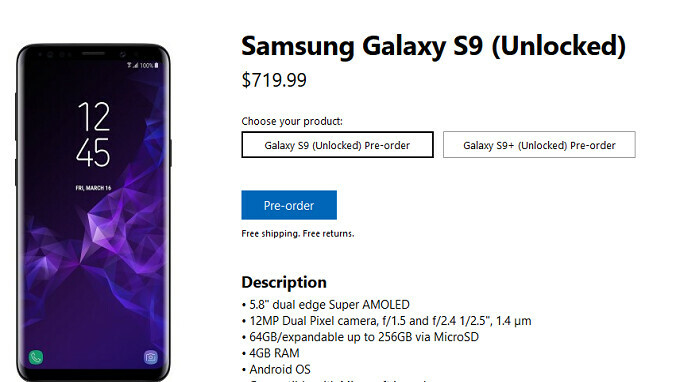 To pre-order your Samsung Galaxy S9/S9+ Microsoft Edition, click on the sourcelink. The phones will ship starting on March 16th. Since 1980 PC users have been tormented by Microsoft on it's way to massive bankrolling of money. Finally ARM architecture and M$'s own neglect of it's near monopolistic control of mobile has landed us in a duopoly in mobile. At least the underlying tech is light year better than what M$ shackled us with for years. Now, M$ wants to take Android phones and loaded their malware onto them for you. At least their doing it for free. Wow... that got... dark. Like really, really dark towards the end. I think he forgot to exhale after he took the hit off the bong. At least Amazon discounts their devices after modding them. If they offered something extra like wireless docking station/VR headset or even a case for it I would have thought it's worth it but you can buy it from other places like BestBuy at the same price. Don't see why someone would buy it from Microsoft store, also you can install all of those applications directly from the Play Store. Even more software I won't use on a Galaxy? Thanks, but no thanks. The "Customization" is aimed at users moving to Android for the first time from the defunct Windows mobile platform. (there are still over 2 million active WM users). You would be suprised how many Windows users do not know that all the apps they are used to are available on Android. Things like this help ease the transition. Also Microsoft having it's apps on as many devices as possible doesn't hurt them either. I hate office mobile. I prefer google shuite on mobile. But desktop is Microsoft.